﻿ Armadillo Repellent - What deterrent works? Armadillo Repellent - What deterrent works? There are no good armadillo repellants for sale. If you want to solve an armadillo problem, the best approach is to live trap the animal in a cage trap, and then relocate it elsewhere. You can also install fencing (be sure to bury it underground) to keep them off of your property. A good fence is actually the best armadillo deterrent available. 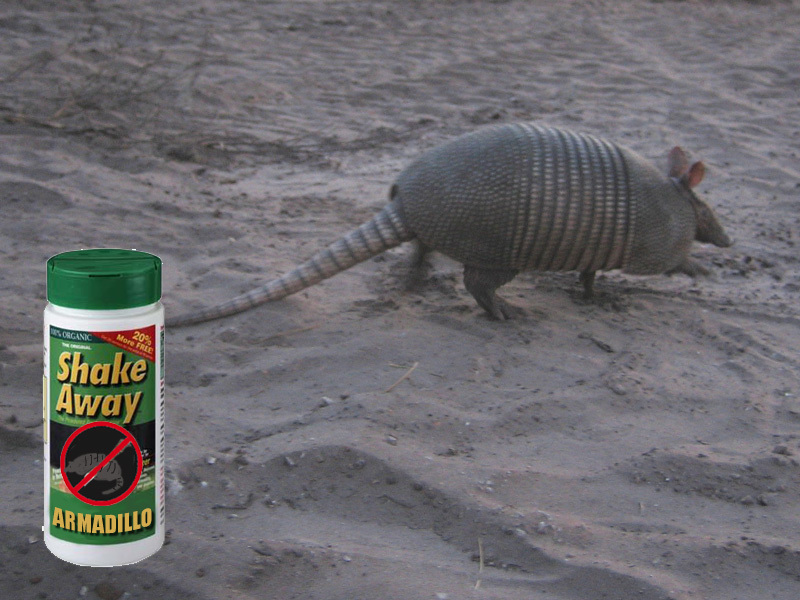 Armadillo Repellent - There are some bogus products sold, even at Home Depot or Lowe's. They are mostly mothballs, which, if spread outside, will poison the environment, but not actually keep away any dillos. In fact, you can put mothballs down the armadillo burrow, and they won't even care. I've seen it firsthand. One of the most popular products that many people will turn to if they are suffering from armadillo problems is repellent, and there are many different commercial products and home remedies that are said to get rid of these creatures. Some people will often have to try many different products and can spend a lot of money trying to find one that works, and some people will also have to try some of the strangest repellents too. The reality is that there is no really effective armadillo repellent that can be sprinkled around the yard or around the boundary of a garden, and most people should look at other alternatives to dealing with an armadillo problem. One of the major problems that many people will have when they are using armadillo repellents is that they will actually struggle with the fact that these products are actually very repulsive to people, and can make a yard or garden an unpleasant place to be. For people who are suffering with armadillos on their property, then the real solution may be to spend some money on a trap instead, or to pay a professional animal removal expert to deal with the issue for them. Armadillo Human Hair Repellent - When it comes to substances that can act as animal repellents, there are an awful lot of myths that can be discovered by searching online, and one of these is that human hair will actually drive an armadillo away. Unfortunately, much like many other old wives’ tales about armadillo repellents, human hair isn’t really effective, and if the armadillo does stop coming to the yard or garden then this is more of a coincidence. There are plenty of people who claim that mothballs are an effective repellent for armadillos, but these are also usually ineffective. The theory behind the use of human hair as a repellent is that armadillos view humans as a predator and will be scared away by the scent of people, but this doesn’t have much basis in reality. Armadillos originally came from South America, and with their thick hides and the difficulty in catching and eating them, there are very few natural predators for them in North America. That said, they are defensive animals and thus armadillos are not dangerous. Although the use of human hair is just a myth, there are real solutions for those people who are really struggling with an armadillo problem, and there are plenty of professionals who can help to solve the problem for you. Do mothballs or ammonia help repel armadillos? The quick answer to your burning question is no. Neither mothballs nor ammonia are effective in repelling armadillos from your property and you will have to other alternative ways in order to get armadillos off your property. Just read the whole article and you can have an idea about alternative method to getting armadillos off your property…But before that, this article will also explain why mothballs and ammonia are not effective in repelling armadillos. The idea behind mothballs is that the strong odor from the chemical found in mothballs (naphthalene) will ward your property against armadillos. This is because armadillos have a very keen and highly sensitive sense of smell and the smell emanating from mothballs is too much for the poor creatures. However, it has been observed by people who have used this method that mothballs placed near armadillo holes and entrances where just brushed aside by the animals and they didn't show any ill effects against them. Armadillos seem like pretty smart creatures as well as they will refrain from ingesting the mothballs and accidentally poisoning themselves which is also the hope of most people who use mothballs as a means to get rid of armadillos. However, it is not true that other animals might not accidentally ingest these mothballs such as beloved pet dogs or cats. Leaving mothballs scattered around your house and property invites other animals to happen upon them and if they aren't as careful as the armadillo, they might end up eating the mothballs and killing them in the process. Poison by mothballs is not a quick or painless process. It may take days for let's say a mouse to die from such a poisoning and it may very well have gone to some unreachable nook or cranny before it does die. Then you will have a whole 'nother set of problems because of it. If you have little children, mothballs are a definite no-no. They too can easily pick up a mothball and ingest them when you aren't looking, thinking that it might be a nice little candy that got left behind. As with mothballs, the same idea is behind the use of ammonia. The pungent smell of ammonia is suppose to ward off those pesky armadillos however, as with mothballs, armadillos have been reported to be affected by it. You can research on both of them before deciding which one you think is best for your situation.